Belgrade Apartments offers accommodation for short term rental in Belgrade. For the business or leisure traveller alike, we offer an exciting alternative options to the existing accommodation in Belgrade. Here you will find a varied selection of serviced apartments. All for short term rent. Are you conducting business at a high level, or travelling in total luxury, and need a short term Belgrade apartment to rent in the heart of the city, we are the answer. We can provide the perfect solution for family Belgrade vacations, with a self contained apartment in Belgrade to give both children and adults the benefit of their own personal space. Whatever your needs are, there will always be a top modern flat, a spacious classic family apartment, or a fully equipped apartment with business facilities, waiting for you. Right here in Wonderful Belgrade. Belgrade apartment rentals offer you an authentic and unforgettable experience of the city. Our apartments offer high quality furnishings, and a stylish décor, that quite often reflects the culture and character of the Belgrade city. Our apartments are right in the heart of Belgrade, providing you with the ideal base to explore all that they have to offer. Staying in the city centre means you will have most things on your doorstep, saving you time and money on travel expenses. When visiting for a short city break, it is especially convenient to be within easy reach of popular landmarks and event venues, to maximise the time you have. Staying in an apartment is a cheaper alternative to hotel accommodation and gives you a fabulous personal space to enjoy your holiday in. Separate sleeping areas, fully equipped kitchens, privacy and freedom to come and go as you please make Belgrade apartment rentals the perfect alternative to hotels for couples, groups, and families. 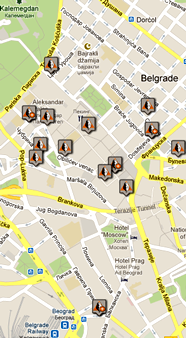 Many visitors travel to Belgrade for a group city break, and often, finding group accommodation is difficult. Belgrade Apartments can provide ideal accommodation for group travellers, with many properties sleeping a large number of guests. Alternatively, we offer many buildings with multiple apartments, so that guests can be close together but still have their individual space and privacy in which to retire after a day's activities in Belgrade. Depending on what you’re looking for, you can select apartments that offer balconies, sun terraces for a relaxing choice of stay, many apartments also offer spectacular city views, and enable you to truly immerse yourself in the city culture, surrounded by local communities, rather than other tourists! When browsing our selection of apartments, you can be assured of the quality of each apartment from our personal visits and honest descriptions and photos. Belgrade Apartments are a fantastic choice of accommodation for your weekend city break or long holiday. Belgrade Apartments enable you to immerse yourself in the city culture and offers the chance for you to discover places off the tourist track and experience a city the way the locals see it. Apartment rental is cheaper than staying in a similar class hotel, helping you make the most of your budget when every penny counts. More space and freedom, to help you get the most out of your trip, with stylish accommodation that feels like a home from home. Completely independent, so you make the choice that works best for you. Because our apartments are located all in the same building they are ideal for large families, friend get together or any large group looking for accommodation in Belgrade and not wishing to stay in the standard Belgrade hotel room. Quality guaranteed, as we rigorously research and grade apartments. Plus detailed descriptions, photos and maps, so you know just what you're getting. We are looking forward to welcome you in one of our apartments in Belgrade. Offering comfortable serviced accommodation and located within close proximity to both Republic Square and Kalemegdan Park this modernised, stylish apartment offer you the opportunity to make yourself at home. Set in a prime location in the heart of Belgrade, this bright, modern apartment offer an ideal base for all visitors. With modern living area and luxurious, comfy bedrooms, guests will find this apartment an ideal for both those visiting on business or planning a short break. Beautiful bright apartment located on the first floor. Sleeps 4 in 2 bedrooms. Set in a great location, within easy reach of the capital's famous sights and attractions. Close to Belgrade's best public transportation hub - Central Station. 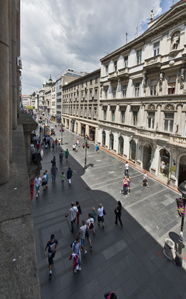 Just a short walk from the best cafes and "Knez Mihajlova street", the main shopping street.